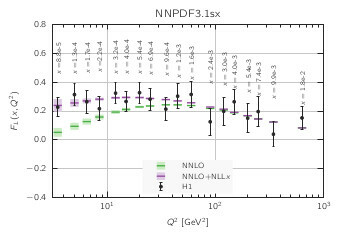 PDF sets extracted using NLO and NNLO fixed-order calculations supplemented by NLLx small-x resummation, based on the same dataset and methodology as NNPDF3.1. Resummation effects are consistently included in DIS cross-sections; a conservative cut is applied to hadronic processes, where small-x resummation is included only in PDF evolution. These PDF sets can be used to computed consistent predictions at (N)NLO+NLLx.